Scientists believe there is a strong possibility they will find new lifeforms if they drill down into a lake buried four kilometres under the east Antarctic ice sheet. Lake Vostok, a body of fresh water about the size of Lake Ontario, is arguably the most isolated aquatic environment on Earth. It is the largest of over 70 sub-glacial lakes on the white continent. The ice cap probably cut the lake off from the rest of the biosphere at least a million years ago - some researchers say 35 to 40 million years ago - and this could have provided a unique opportunity for life to develop along a separate evolutionary path. But if life really does exist down there today, it would have to be capable of withstanding extremes of cold and pressure and survive in waters that are completely dark and contain precious few nutrients. Nevertheless, scientists are confident some micro-organisms could inhabit such a hostile world. "Everywhere we go, we are turning up new micro-organisms," said Dr Cynan Ellis-Evans, a microbiologist with the British Antarctic Survey. "It doesn't matter how extreme the environment is, we find them. We can go to hot springs, or situations that are poisonous, and we still find micro-organisms." Dr Ellis-Evans was speaking at a specially-convened conference in Cambridge, UK, where the international scientific community have been discussing the merits of drilling down into the lake. Geologists and glaciologists would like to study the feature more closely because they believe it could give them a better understanding of the structure and movement of large ice sheets. "We would like to know why that hole under the ice sheet is there," said Dr Robin Bell from the Lamont Doherty Earth Observatory, Colombia. 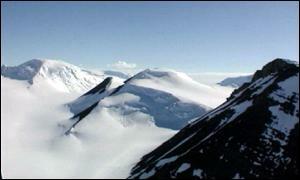 "It may have something fundamental to do with Antarctic geology that we don't yet understand. Is Lake Vostok like the lakes in Africa where the Earth is being pulled apart? There, a giant basin forms which fills with water and mountains form along the edge and you get volcanoes and hot springs. We just don't know." The US space agency Nasa is taking a close interest in Lake Vostok because it is keen to develop technologies that might help in the search for life on extra-terrestrial worlds. A prime candidate would appear to be the Jovian moon Europa, which is thought to have giant oceans beneath its ice-encrusted surface. "Europa has, from our current calculations, the largest ocean in the solar system," said Dr Frank Carsey from Nasa's Jet Propulsion Lab in Pasadena. "Lake Vostok could provide a unique technology test-bed and provide an opportunity for Nasa to apply its technical expertise to investigate a novel environment here on Earth." The Russians are very much involved because they the only research station in the area. In 1998, the station was site of an international project to drill down into the ice just above the lake. This yielded the deepest ice core ever recovered, reaching a depth of 3,623 metres. The drilling was halted about 120 metres short of the lake itself to prevent any drilling fluid contaminating the waters below. Even so, the core has been the subject of extremely rewarding research. It contained a range of bacteria, fungi and algae, with ages up to 200,000 years. Similar biota may have "seeded" the lake. Molecules of gas trapped in the core also suggest that clathrates - crystals with concentrated pressurised gases at their core - may exist within the lake. These crystals could provide the "foothold" on which microbial communities could survive. But even if the scientific community feels it is worth exploring the lake in more detail, they face considerable technological and logistical problems. The Vostok region, which lies some 1,500 km from the coast and 3,500 metres above sea level, is the most inhospitable place on Earth that man has lived for any length of time. It was there that the lowest ever temperature was recorded on the planet, -89.2C. Establishing a major drilling project with all the support and supplies needed to sustain it through many months in these freezing conditions would be testing enough. But the technology that would be necessary to drill into the lake without contaminating the unique ecosystem that may exist in its waters has yet to be developed. "If we go into this lake, we've got to go in clean and we've got to come out without leaving any major contamination," said Dr Ellis-Evans. "We're making things a lot more difficult for ourselves. The technologists say it can be done but it will be costly and it will take time." One plan envisages the use of bullet-shaped probe carrying a range of instruments, cameras and perhaps robotic submarines. This would be dropped down a drill hole into ice just above the lake waters. A hot tip would then melt the ice in front of the probe, carrying it the final few metres into the lake. Crucially, the intense cold and pressure would seal the hole behind probe, limiting the risk of contamination. The drilling proposal has already drawn fire from the green lobby. The Antarctic and Southern Ocean Coalition (ASOC) is determined to oppose what is calls "the hype that surrounds Lake Vostok". "We're not opposed to science," said Ricardo Roura from ASOC, "but they should think small. They should drill one of the smaller lakes first." Lake Vostok is about 230 km by 50 km in area, and 500 m deep. "We were amazed by the amount of water down there"
"Drilling down will be the biggest Antarctica project ever undertaken"
"We hope to learn something about how Lake Vostok was formed"
"Lake Vostok could provide a useful technology test-bed"